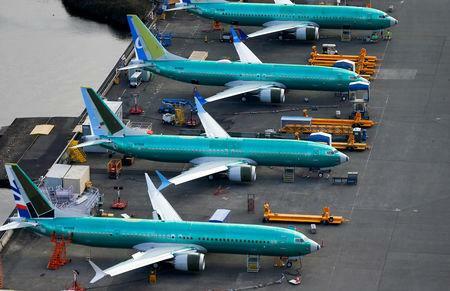 SEATTLE/KIGALI (Reuters) - Boeing Co will provide airlines that have bought the 737 MAX with free software upgrades, the U.S. manufacturer said on Monday, as Ethiopian Airlines told Reuters it expected a preliminary crash report this week or next. The U.S. Transportation Department said Monday it is forming an outside panel to review the Federal Aviation Administration's aircraft certification program amid growing concerns after two fatal Boeing 737 MAX crashes since October. "Despite the tragedy, Boeing and Ethiopian Airlines will continue to be linked well into the future," Tewolde said on Monday. "Ethiopian Airlines believes in Boeing. They have been a partner of ours for many years." The sessions follow a briefing with carriers including three U.S. airlines on Saturday, part of Boeing's effort "to communicate with all current, and many future, MAX customers and operators," a Boeing spokeswoman said. Boeing's shares closed 2.3 percent higher at $370.46 on hopes that a fix is nearing completion, but have lost about 12 percent and $29 billion in market value since the March 10 crash. Boeing's software fix for the grounded 737 MAX will prevent repeated operation of an anti-stall system at the center of safety concerns, and deactivate it altogether if two sensors disagree widely, two people familiar with pilot briefings said. Upgrading an individual 737 MAX with Boeing's new software only takes about an hour per plane, though the overall process could stretch on far longer as it is rolled out across the global fleet due to stringent testing and documentation requirements by engineers and regulators, according to a senior FAA official with knowledge of the process. "Clearly there is pressure to get the airplanes ungrounded but there is tremendous pressure to make sure it was done right," the FAA official said. "The last thing in the world you want is to have the thing hurried and then find problems with it." Ethiopian and French investigators have pointed to "clear similarities" between the two crashes, putting pressure on Boeing and U.S. regulators to come up with an adequate fix. No direct link has been proven between the crashes but attention has focused on whether pilots had the correct information about the "angle of attack" at which the wing slices through the air. Garuda Indonesia was invited to the briefing but requested a webinar instead, only to be rebuffed, Chief Executive Ari Askhara told Reuters on Monday. Last week, Indonesia's national carrier said it planned to cancel its order for 49 737 MAX jets, citing a loss of passenger trust.